you're going to try and weld/build it up yourself? from scratch or mod something? with a motor? because I've never done that and don't know about extra stresses. truthfully I'm nobody's expert on it. I do the cut up freakbike thing. 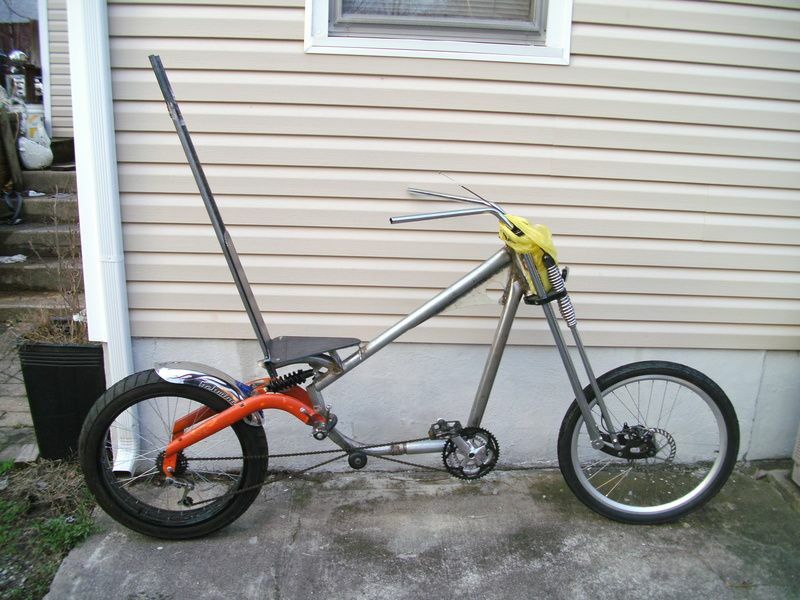 the easiest would probably be to mod/cut up a Schwinn occ chopper. I don't like how they steer though, no matter what you do with them (maybe lessen the rake, but I didn't try that). 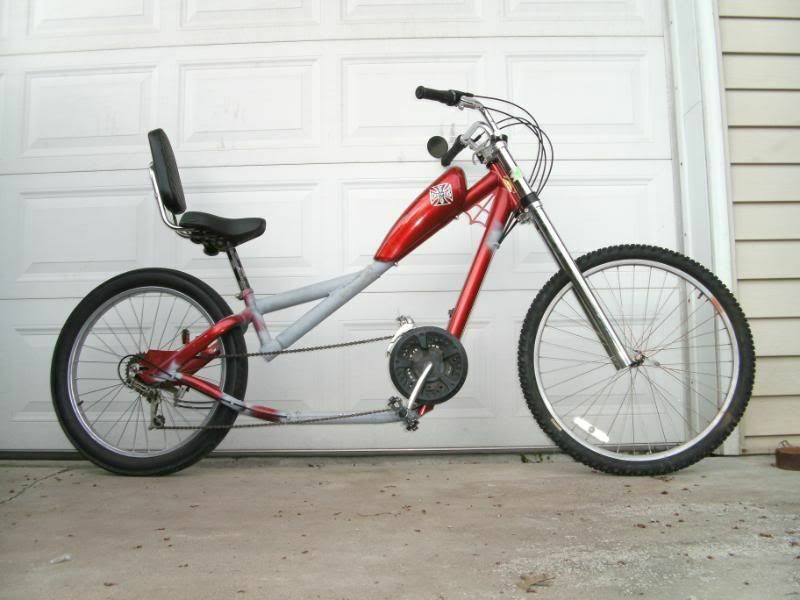 I don't have a completed rideable Schwinn chopper. I just couldn't get what I wanted out of them. 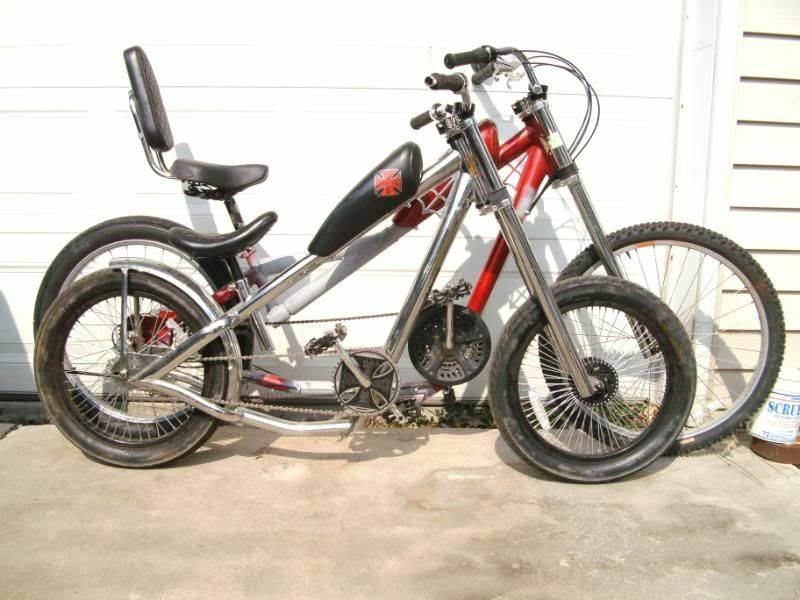 the better base bike to me, is the huffy jesse james wcc chopper. probably just as easy to mod, but maybe a little harder to find. I also think they're a little easier to ride unmodded as an adult (I'm 5'11"), but still pretty cramped. style-wise, probably the easiest thing is to combine the two. start with a wcc and stretch it, then add the back section of an occ to get the 20x4 tire, and add the bottom bracket from the occ to space out the pedals/sprocket to match. if I ever do another that's what I plan to do (I think I'm building my last chopper right now though). but like I said, I'm no expert. I've been fooling with it off and on for years and building as the idea comes to me. I also have no motor plans so I don't know how much more stress beyond pedaling it would take. I would think that each bike is "unique". Schwinn made a number of "chopper" bikes that are available around here, some are dirt cheap. However, you can browse the internet for direct side views of bikes you like. Then import them into your favorite graphics program. The compare dimensions to known sizes such as wheels. If you're going to be the intended rider, then you can use your arm reach and leg reach as some of the intended dimensions. Head tube angles can vary significantly. Chromoly (4130) is a common frame building material, but you can also build with a cheaper high tensile steel. Perhaps there would be two design approaches. Browse around for good deals on parts available. Wheels, cranksets, & etc. Then design your bike around what you come up with. Design your bike to your ideal specs. Then head out and find the parts you need to make it happen. In reality, you'll probably do a bit of both. Figure out what is available as a target for your design. Otherwise you'll spend a fortune on new and custom parts. Here in the USA, there are a few cheap fat tire bikes. The Mongoose Massif can donate 20 x 4 1/4" tires. Perhaps a few others too. Front tires on choppers can be big or small, your choice for your design approach. eh... back in my day... we just sawed whatever spare forks we had off at the crown and hammered them on to our bike forks. we didn't know nuthin' 'bout fancy geometries, weldin', safety, color co-ordinatin' or nuthin'. Last edited by wreckembent; 06-21-16 at 06:11 AM. Yup I had a chopper with forks that were from a scaffold hammered right over the original fork tubes. Cool project, gas or electric? There's about a free bike a week on Craigslist here. I was thinking of getting one and chopping that up to get the geometry for a chopper. My dad did this when I was a kid with parts he found at the local dried up " Creek "/ unofficial dumping area. If I remember right he actually put screws in it, but he sold it to a neighbor friend a long time ago. It worked for sure but wasn't how I would choose to do it today. If I was to do this I'd go with some kind of ratrod theme and make it appear as though it's supposed to look cobbled together from junk. Ah yes, those truly were the days! Saw/chop, weld & paint. Voila! Custom bike! Oo LALA that's awesome man! Plz tell me where i can get this? ?